by-reference parameter passing that allows the API to change the input object itself, not only its content. Sometimes you want to have both for a parameter: the ability to omit it and to change it. This is something COM supports but unfortunately this is not supported by C#. Recently one of my customer needed precisely that for a COM API developed in C# migrated from VB6 where it was plug-and-play. The original developers of the API had done a quick study and concluded that it was not possible with the new C# API and indeed it was not documented at all. From experience I know that COM is not used a lot today and that resources are scarce, so, to be sure, I’ve done my due diligence and reexamined the issue, digging a little deeper and testing undocumented stuff. I’ve finally found a solution that I would describe as a “trick”, because it’s not documented, and that I’ll present in detail in this article. En tant que développeur et formateur WPF depuis plusieurs années les nouvelles orientations de Microsoft pour les plateformes clientes, avec la montée en puissance du tout nouveau WinRT, m’ont quelque peu inquiétées. Et pour cause : j’ai directement subi l’échec et l’abandon de Silverlight et comme dit le proverbe “chat échaudé craint l’eau froide”. Depuis 2009 j’ai beaucoup investi, personnellement et professionnellement, dans WPF, l’utilisant pour développer des applications LOB dans le secteur financier, et désormais je dispense même des formations sur le sujet. Par conséquent le futur de WPF est critique pour moi, c’est pourquoi j’ai étudié cette question de l’avenir de WPF plus en détails, mettant en oeuvre mon expertise sur le sujet et ma récente découverte de WinRT. Dans cet article je partagerai avec vous les résultats de cette “étude” en toute objectivité et transparence, afin de vous aider en tant que partie prenante dans votre veille technologique. J’espère que vous fournirez vos propres informations, afin que la communauté toute entière puisse avoir une meilleure vision des perspectives pour WPF. Dans la dernière partie de l’article je fournis des stratégies pour les entreprises et les développeurs utilisant WPF. I was concerned for good reasons: I’ve suffered from the collateral damages of the Silverlight failure, and as the proverb says “once bitten, twice shy”. I’ve recently passed the Microsoft 70-483 “Programming in C#” certification which is one of the entry point into the .Net and WinRT developers certification cycles. 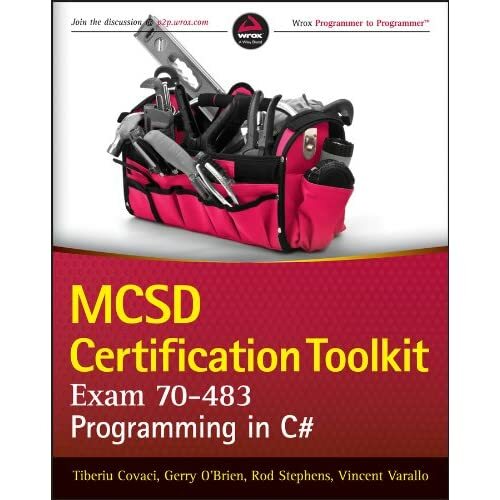 To be well prepared I’ve read the two books entirely dedicated to this certification : MCSD Certification Toolkit (Exam 70-483): Programming in C# and Exam Ref 70-483: Programming in C# . I strongly recommend you read both of them if you intend to pass the certification. Indeed both have been my main material to prepare for the certification and they have perfectly done the job. This article is a complete review of MCSD Certification Toolkit (Exam 70-483): Programming in C# . This is the first book you should read because I think this is the one that will best prepare you to get the certification, but paradoxically the worst from a technical point of view, and you will quickly understand why. J’ai tout récemment passé et obtenu la certification Microsoft 70-483 “Programming in C#” qui est l’un des points d’entrée des cycles de certification développeur .Net et WinRT. Pour m’y préparer j’ai notamment lu les 2 livres qui y sont dédiés (en anglais) : MCSD Certification Toolkit (Exam 70-483): Programming in C# et Programming in C#: Exam Ref 70-483 dont je vous conseille vivement la lecture. Ils ont en effet constitué mon support principal pour la préparation de la certification et ont bien remplis leur office. Cet article est une revue complète de MCSD Certification Toolkit (Exam 70-483): Programming in C#. C’est le 1er livre que vous devriez lire, je pense celui qui prépare le mieux à la certification, mais paradoxalement le moins bon techniquement, et vous allez vite comprendre pourquoi. Following my previous article on a similar subject, Extend your VBA code with C#, VB.Net or C++/CLI, I’ve received an interesting feedback from a VBA developer who wanted to leverage the advanced support of the .Net framework for regular expressions. This is clearly another interesting use-case for Excel addins and in this article I’ll quickly demonstrate how to build a wrapper which will close the gap between your VBA code and the .Net framework. I’ve recently wanted to demonstrate the relevance of the .Net ReaderWriterLock[Slim] synchronization primitives. It’s good to hear from the vendor that it’s better, faster, stronger, but when you can it’s always good to evaluate it yourself; not that I don’t trust vendors, but because I like to have hard numbers, particularly when I assert something that can be critical for my participants’ developments. So I’ve built a small, simple and I hope relevant benchmark to measure the performance impact of ReaderWriterLock[Slim] compared to the naive and uniform use of a Monitor using the C# lock construct. what is the profile of the gain function. In this article I’ll explain the rationales behind the benchmark, how I’ve implemented it and finally present the results. For a training session I’ve taught at the end of last year I wanted to demonstrate some subtleties of multi-threading, and more specifically some memory visibility issues that should cause a program to hang. So I developed a small sample that I expected would be showing the issue, but instead of hanging as expected the program completed! After manipulating the program further I obtained the behavior I wanted, the program was hanging, but it still didn’t explained why it managed to complete with my original version. I suspected some JITter optimizations, and indeed it was the case, but I needed more information to completely explain this strange behavior. As often, the StackOverflow platform was of great help; if you’re curious you can have a look at the original SO thread. In this article I’ll “build” and explain the issue step by step, trying to make it more understandable than the SO thread which is indeed quite dry. This is a small article about an issue I had recently trying to save some big documents represented as .Net objects in MongoDB using the MongoDB .Net driver. System.IO.FileFormatException: Size 32325140 is larger than MaxDocumentSize 16777216. Well the message is clear: seems like I’ve exceeded the MongoDB max document size threshold which is 16MB, fair enough this is quite a sane design decision. First I’ll explain why I had this issue, then how I’ve solved it.